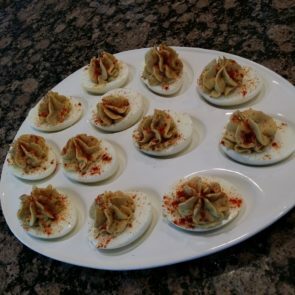 I don’t particularly like southern style deviled eggs, but I find the traditional style to be somewhat boring. What to do, what to do. I know! How about Worcestershire instead of vinegar and lots of cumin? Sounds good, right? It is, it is. Deviled eggs with Worcestershire and cumin, whipped up light and fluffy, and sprinkled with smoked paprika and a tiny bit of chipotle chili pepper. You need the yolks from 12 eggs to make 20 fluffy deviled eggs! Just nom on the extra whites with a little salt while mixing everything else up. My preferred method for perfect hard boiled eggs is to bring the water to a full and rapid boil, then cover and remove from the heat and let the eggs sit for exactly seven minutes. Perfect every time!